This is the most adorable Dolce & Gabbana Baby boys mini me look from the Sicilian Western' theme, featured on the runway at the Men's Collection at Milan Fashion Week. Create the look for your little guy with this blue denim shirt featuring assorted appliqué on the front, including a stetson, lucky clover and spaceship, in a fusion of Sicily meets the Wild West. 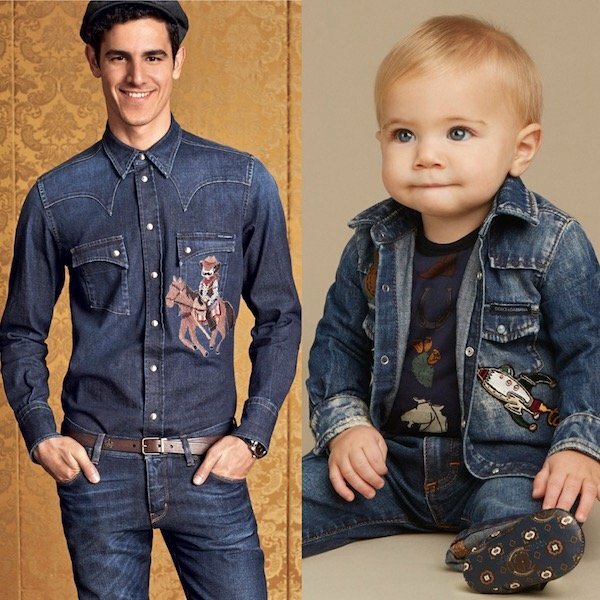 Complete the look with these DOLCE & GABBANA Baby Boys Blue Denim 'Sicilian Western' Overall Jeans embroidered with 'Sicilian Western' logo patches on the front and a DOLCE & GABBANA Boys Blue Wool 'Sicilian Western' Sweater.